Sponsor a village in an existing district to setup three learning centers for a minimum of five years. Since the effort taken to setup a new village is immense, Vidyarambam requests donors to support the set up of three learning centers and for a minimum period of five years to sustain the operations. Our goal is to be able to reach to the remotest of the villages in Tamil Nadu to setup Vidyarambam learning centers - that offers free supplemental learning in a fun and enjoyable manner. This will pave the way to educate under achievers and bring them to the fold into regular schools. Can I choose the village / district? Yes you can request for a village or village / district of your choice and Vidyarambam will work with you to study feasibility. If your chosen village is within an existing district that Vidyarambam is already present in, then the request is for you to sponsor 3 learning centers for a minimum period of five years. If your chosen village is not within an existing district then Vidyarambam will conduct a feasibility study in the new district and will require at least a minimum of 5 villages to be sponsored for 3 years. This is to help support and sustain the new district under the Vidyarambam model. Vidyarambam will be able to reach out to additional villages of your choice or where the need is greatest. An entire village benefits from having the learning centers and programs that support their children and enable them to go after their education. Rs.1,08,000/ Per village / Per Year and for a minimum of Three years. I want to Fund a Village. 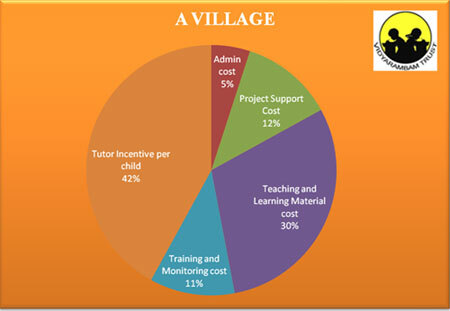 Fund a village with 3 learning centres and 60 children.